Quick wicking, high wet strength padding with non-woven cover. Sterile padding has absorbent lamino filler, non-sterile padding has non-absorbent back. 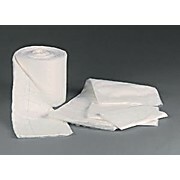 Available in either an all absorbent fill (AAF) or with a non-absorbent backing (NAB) to impede fluid strike through.